The only difference between the two, really, is that Dunaway’s concept has you thinking on a horizontal plane, as if swinging into a carpet or rug on the clothesline, and my concept has the visual of the actual angle down to the ball sitting on the tee or ground. The whole point of both of these concepts is that you shouldn’t be trying to “drag” the club through impact with the hands and arm, but releasing through the bottom. If any of you watch golf on TV, you’ll see Justin Rose doing a sort of “3 To 9” drill himself before he swings – the only difference is that he has a “swing left” thing going on with the extension and release part, but there’s no mistaking what he’s practicing. DJ – I just read Philip Reeds book on Mike Austin. Fun read, but not a lot of instructional stuff that made sense. They do talk about the Austin takeaway, where the right wrist actually pronates over the left on the way back (in contrast to most PGA teaching, where the left rolls over the right). I struggle to understand this concept. Have you heard of this? Confusing. I’ll tell you exactly what I think, having been in the Mike Austin golf swing camp from 2009-2013 (and I’ve got Philip’s book on Austin, which he sent to me in 2010 when I was doing most of my blogging on the Mike Austin swing method). 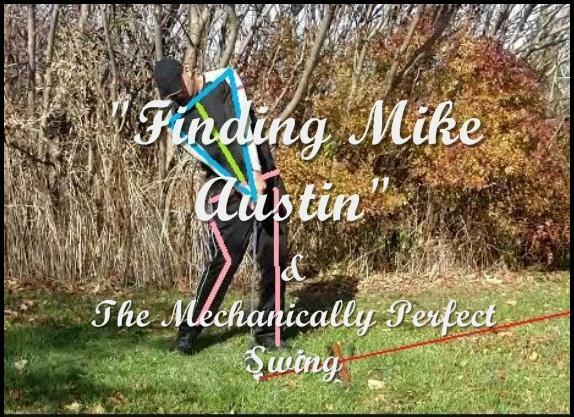 The Mike Austin swing model is virtually the same as MCS – in fact my original MCS golf swing model and earlier videos (up to MCS 3.0 in 2013) were based on Austin’s, until I left that school of thought in 2013 to develop MCS based on what I was researching, and not on any other people’s models. The only difference between Mike Austin’s swing model and MCS is in the address setup. MCS has the right-biased setup and Austin/Dunaway were center-biased, which produces a shifting head on the back swing. There is virtually no other difference. That’s why I spent five years on his model – it is mechanically-correct, just not optimal due to the shifting head, but if you took my model and center-biased the setup, or took Austin’s and right-biased it – you get the same models and swing mechanics. It is believed that after Austin had his stroke and he could no longer make normal swings, he changed his view on the teaching of the hand action to remove any rolling over action. So, he never actually swung this way himself, and it wasn’t part of the swing model of his that he taught for decades, it was an add-on, so take it for what it’s worth. The problem with Austin (other than the setup bias) is that most of what he talked about in minute detail happens anyway, so there’s no need to think about it – the simpler the concept and thoughts, the better. The way he explained things sounded very impressive and clinical, but doesn’t really help one understand the swing any better, IMO. Can you imagine a baseball pitching coach trying to explain how to pitch properly by describing in minute detail every muscular action from the beginning of the stretch to release? Good luck with that! 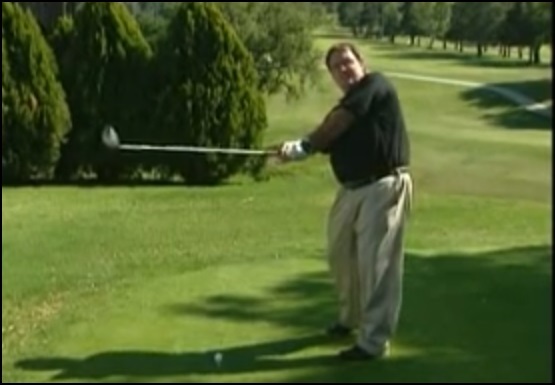 I must take my hat off for DJ and the way you teach a golf swing. Ive been into Mike Austin for some years now and you are the only one that made me understand what he was doing. The video you did a few years ago about swinging a stick for speed made it very simple. Its easy to get things to complicated when you look at different sites about Austin, people talk about throwing from the top and all sort of things that makes everything confusing. Ulf, thanks for the kind words, and yes, you’re talking about “MPS – Finding Mike Austin,” the video I based on the simple action of swinging a stick! Yes Tom he’s got quite the harpoon going there… I have also noticed that he’s no longer letting the leading heel separate and that could be it there. I blogged before on the harpoon being a result of beginning the down swing having made a restricted-hip pivot.